Week 7 was another good one for Cowboy Alumni in the NFL, particularly for Tashaun Gipson, who had two interceptions on Sunday and is now tied for the league lead in that category. Malcom Floyd, WR, San Diego Chargers- Floyd caught 3 balls for 50 yards, with a long of 24 yards in the Chargers (5-2) 20-23 loss to the Chiefs. Floyd’s 20.6 yards per catch remains one of the best in the NFL, he is 3rd among receivers with 10 catches or more and 1st among receivers with more than 10 catches. 2014 Stats: 7 G 7 GS 20 REC 412 YDS 20.6 YDS/REC 58.9 YDS/GAME 3 TD. Tashaun Gipson, S, Cleveland Browns- Gipson had a big game again in week 7. He intercepted 2 Blake Bortles passes and had 4 total tackles. You can see Gipson’s first interception and run of 31 yards here, and his second one is the first highlight here. His 32 return yards on his interceptions brought his season total to 111, which is the most in the NFL this season. 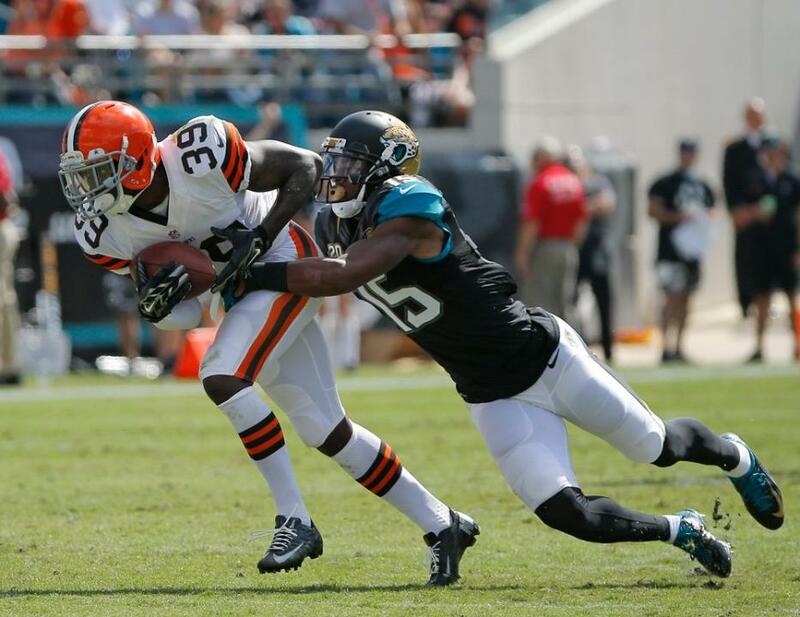 Gipson is now tied for the NFL lead in interceptions (4) and his 9 passes defended is good for T8. His 32 TT and 18 solo tackles remains some of the best on the Browns. You can hear Tashaun’s thoughts on the loss here. Robert Herron, WR, Tampa Bay Buccaneers- The Bucs had a much needed bye in week 7. Marqueston Huff, DB, Tennessee Titans- Huff had 2 TT, one solo, in the Titans (2-5) week 7 loss to the Redskins. Huff continues to contribute when given the opportunity. Mitch Unrein, DT, Denver Broncos- Unrein was inactive again this week for the Broncos (5-1) 42-17 victory over the 49ers. Unrein has now been inactive for 5 of Denver’s 6 games. Chris Prosinski, S, Free Agent– Prosinski remains a free agent after playing in the Jaguars first three games before getting released after a hand injury.